Buncrana Together is non-aligned anti water charge group. However, we are and have always been an advocate of non violent protest including mass protest, boycotting water charges, Irish Water and water meters. We will support any party that genuinely supports the campaign but we will also criticise any who try to undermine, deceive, defeat or follow party agenda instead of the interest of the campaign and in turn the people. The above Anti Austerity Alliance press release was in response to ongoing negotiations between Fine Gael and Fianna Fail parties to form a government. These negotiations have been dragging on now since the Jan 29th Irish general election. The main sticking point, or so we are led to believe' is Irish Water and 'Water Charges'. Fine Gael is the major party in the outgoing government and won the majority of seats in this years elections. They are responsible for introducing Irish Water and 'Water Charges. Fianna Fail received the second highest number of seats, having recovered from near obscurity, by, some would say, promising to abolish Irish Water and 'Water Charges', clear policy principles in their manifesto. The article below is from RTE, RTE April 27, 2016, reports on the present stance of the negotiations. It must be said that there has been no official statement of agreement to datebut everything indicates the outcome which RTE is giving. This outcome it must be said would seem to be a total capitulation by Fianna Fail, a total reversal of their manifesto promises. It would also be in opposition to what the majority of the county voted for. Minister for Jobs Richard Bruton has confirmed that there will be a temporary suspension of water charges under a proposed deal with Fianna Fáil to form a minority government. He also said if charges did not return then those who have paid will have to be fully reimbursed. Fine Gael and Fianna Fáil negotiating teams are due to resume talks later today. The first strand of their proposal is to retain Irish Water but an external advisory board will be set up to improve its transparency, accountability and also how it works. Under the plan, the board would report to the Oireachtas. On water charges, it is suggested that an independent commission would look at the overall funding model and conservation matters. Its recommendations would then be referred to an Oireachtas committee but it would not be bound by the commission's proposals. In turn the committee could make its own proposals which the Dáil would then vote on. As the commission and committee examine the issue, it is proposed that water charges would be suspended for nine months though there is the possibility of this being extended. The technical details still have to be finalised and the proposal has not yet been formally agreed. Mr Bruton said Fine Gael will "defend to the hilt people" who have paid water charges. Speaking on RTÉ’s Morning Ireland, he said there could be no question of people being left at a loss if a decision were taken in the future to abolish water charges. If water charges are to be scrapped, then people who have already paid their bills will have to get their money back, he said. In the event that charges continue in the future, he said that those who were in default will have their outstanding bills pursued. Mr Bruton said Fine Gael did not win the election so it cannot impose its policy on the Dáil. He said the bigger picture was that a government needed to be formed to deal with pressing issues and it could not be a government that will fall at the first hurdle. Great progress has been made in talks, he said, but added that a lot of work remains to be done and it still has to be put to independents. Also speaking on the programme, Fianna Fáil TD Billy Kelleher said he could not put a time frame on how long charges will be suspended for. He added that establishing a commission would finally get Irish Water and the "consistent running sore in Irish politics" back into the parliamentary process where there can be accountability in the Dáil. Those who paid the charges, he said, should get their money back if they are scrapped. Both parliamentary parties will have their say; Fine Gael will meet later today or possibly tomorrow while Fianna Fáil has not yet confirmed when it will meet. In the Dáil chamber, all parties and independents will get an opportunity to discuss water charges as a debate on the issue will take place this afternoon. However, Sinn Féin has argued for a vote on the matter. Paul Murphy, Anti Austerity Alliance TD, has responded to late payment messages from Irish Water and argues against misinformation and rumours. Irish Water is sending these out at a fierce rate now. Who do you think is paying the bill for all these threatening texts? Having failed to get more than 50% to pay the water charges, with no mechanism to take the money off people, they are reduced to fear, fear and more fear. Texts, phone calls, threatening letters – it’s all they have to persuade people to pay. We have to get the message out – don’t panic and don’t pay. 1. 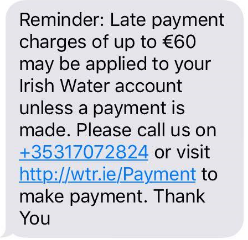 Yes, in July 2016 if water charges still exist, they will add an extra €30 or €60 as a penalty to your bill if you haven’t paid. But they can’t get it off you anymore than they could get the almost €200 that most people owe now! 2. They can’t deduct water charges from wages, social welfare or pensions. Despite all the scaremongering out there, and despite its repetition by some people who oppose water charges but who don’t support the boycott, they cannot take it off us. 3. The only thing they can do is when people owe €500, they could start a court process, which involves two court cases, which eventually could result in an attachment order. But the court services themselves have said they would be completely clogged up if they go down that road. If we stick together and don’t pay, this court action can’t break non-payment, like it couldn’t break it in the 1990s, when non-payment won. 4. If water charges remain, they will jump to an average of €500 per family when the cap is lifted in 2019. An average adult (based on using 148 litres per day, which is a Department of Environment figure) will owe €200 a year. Just look at the green bin charges – we know if they get it in, it will only go up and our water will be privatised.